1959 Invitation to join us in research on problems of speech and other skilled bodily movements. Boston: Speech Research Laboratory, Children’s Hospital Medical Center. 1960 Language, evolution, and purposive behavior. In S. Diamond (Ed. ), Culture in History Essays in Honor of Paul Radin. New York: Columbia University Press. 1964 A biological perspective of language. In E. H. 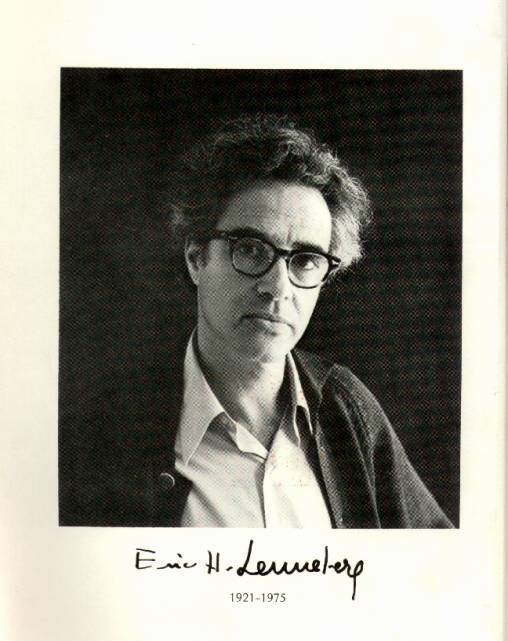 Lenneberg(Ed. ), New Directions in the study of Language. Cambridge, Massachusetts: MIT Press. The capacity for language acquisition. In J. A. Fodor and J. J. Katz (Eds. ), The structure of Language: Readings in the Philosophy of Language. Englewood Cliffs, New Jersey: Prentice-Hall. How babies learn to talk. Parents’ Magazine, September. 1966 Speech development: Its anatomical and physical concomitants. In E. C. Carterette (Ed. ), Brain Function (Vol. III). Los Angeles: University of California Press. The natural history of language. In F. Smith and G. A. Miller (Eds. ), The Genesis of Language: A Psycholinguistic Approach. Cambridge, Massachusetts: MIT Press. In search of CNS correlates of reading skills and disabilities. In Project Literacy Reprots. Ithaca, New York: Cornell University. 1967 Biological Foundations of Language. New York: Wiley. Discussion of :The general properties of language, by Noam Chomsky. In C. H. Millikan and F. L. Darley (Eds. ), Brain Mechanisms Underlying Speech and Language. New York: Grune and Stratton. 1969 Problems in the systematization of communication behavior. In .T. A. Sebeok and A. Ramsay (Eds. ), Approaches to Animal Communication. The Hague and Paris: Mouton. Language in the light of evolution. In .T. A. Sebeok (Ed. ), Animal Communication: techniques of Study and Results of Research. Bloomington: Indiana University Press. A word between us. In J. D. Roslansky (Ed. ), Comminication. Amsterdam and London: North-Holland. 1970 Brain correlates of language, in F. O. Schmitt (Ed. ), The Neurosciences: Second Study Problem. New York: The Rockefeller University Press. 1971 The importance of temporal factors in behavior. In D. L. Horton and J. Jenkins (Eds. ), Perception of Language. Columbus, Ohio: Charles E. Merrill. 1972 Prerequisities for language acquisition by the deaf. In T. J. O’Rourke (Ed. ), Psycholinguistics and Total Communication: The State of the Art. Washington, D. C.: American Annals of the Deaf. 1973 What is meant by knowing a language? In P. Pliner, L. Kranes, and T. Alloway (Eds.) Communication and Affect: Language and Thought. New York and London: Academoc Press. 1974 Language development. In J. A. Swetts and L. L. Eliot (Eds. ), Psychology and the Handicapped Child. Washington D. C.: Department of Health, Education, and Welfare, U.S. Government Printing Office. Biological aspects of language. In G. A. Miller (Ed. ), Psychology and communication (Forum Lecture Series). Washington D. C.: Voice of America. 1975 The concept of language differentiation. In E. H. Lenneberg and E. Lenneberg (Eds. ), Foundations of language Development: A Multidisciplinary Approach. New York and Paris: Academic Press and Unesco Press. In search of a dynamic theory of aphasia. In E. H. Lenneberg and E. Lenneberg (Eds. ), Foundations of language Development: A Multidisciplinary Approach. New York and Paris: Academic Press and Unesco Press. 1976 Problems in the comparative study f language. In R. B. Masterson, W. Hodos, and H. Jerison (Eds. ), Evolution, Brain, and Behavior: Persistent Problems. Hillsdale, New Jersey: Lawrence Erlbaum Associates. 1977 Introduction to section on language acquisition. In F. Caplan (General Ed. ), Parenting Advisor. New York: Anchor Press/ Doubleday. 1953 Cognition in ethnolinguistics. Language, 29, 463-471.
Review: Meaning, Communication, and Value, by P. Kecskemeti. Language, 30, 96-99. 1955 A note on Cassirer’s philosophy of language. Philosophy and Phenomenological Research, 15, 512-522.
Review: Psychologie der Sprache: Vol.3, Physiologiche Psychologie der Sprachvorgange, by F. Kainz. Language,31,489-492. 1957 A probabilistic approach to language learning. Behavioral Science, 2, 1-12.
Review: Der Mensch und sein Wort, by A. Schlismann. Language, 32,714-716.
Review: On Human Communication: A review, a Survey, and a Criticism, by C. Cherry. Language, 33, 568-575.
Review: Fundamentals of Language, by R.Jakobson and M. Halle. Contemporary Psychology, 2, 133-134. 1960 Review: Speech and Brain Mechanisms, by W. Penfield and L. Roberts. Language, 36, 97-112. 1961 Color naming, color recognition, color discrimination: A re-appraisal. Perceptual and Motor Skills, 12, 375-382.
Review: The Sound of Language: An Inquiry into the Role of Genetic Factors in the Development of Sound Systems, by L. F. Brosnahan. Contemporary Psychology, 7, 230-231. 1962 A laboratory for speech research at the Children’s Hospital Medical Center. New England Journal of Medicine, 266, 385-392. Understanding language without ability to speak: A case report. The Journal of Abnormal and Social Psychology, 65, 419-425. The relationship of language to the formation of concepts. Synthese, 14, 103-109.
Review: The First Five Minutes: A Sample of Microscopic Interview Analysis, by R. E. Pittenger, C. F. Hockett, and J. J. Danehy. Lag--uage, 38, 69-73.
Review: The Role of Speech in the Regulation of Normal and Abnormal Behavior, by A. R. Luria. Psychosomatic Medicine, 24, 231. 1963 Review: Message et Phonétique: Introduction à l’ Étude acoustique et physiologique du Phonéme, by Jean-Claude Lafon. Language, 39, 246-247. 1964 Language disorders in childhood. Harvard Educational Review, 34, 152-177. Speech as a motor skill with special reference to nonaphasic disorders. In U. Bellugi and R. W. Brown (Eds. ), The Acquisition of Language, Monographs on the Society for Research in Child Development, 29, (1, Serial No. 92). Discussion of Dr. Holzman’s paper. American Psychiatric Association, Psychiatric Research Report, 19, 93-96.
Review: Disorders of Language, Ciba Foundation Symposium, A V. S. de Reuck and M. O’ Connor, eds. Pediatrics, 34, 898-899.
Review: Signs, Signals and Symbols: A Presentation of a British Approach to Speech Pathology and Therapy, S. E. Mason, ed. Language, 41, 91-94. 1967 The biological foundations of language. Hospital Practice, 2, 59-67. Reply to : Language and the search for origins (book reviews of Biological Foundations of Language by S. Klassen and J. M. Wepman; H. G. Furth; and J. W. Black). Journal of communication Disorders, 1, 320-322. 1968 The effect of age on the outcome of central nervous system disease in children. In R. Isaacson (Ed. ), The Neuropsychology of Development. New York: Wiley. 1969 On explaining Language. Science, 164, 635-643. 1970 What is meant by a biological approach to language? American Annals of the Deaf, 115, 67-72. The neurobiology of language: Practical applications. Bulletin of the Orton Society, 20, 7-13. Fundamentos biológicos da linguagem. Publicaςoẽs Avulsas fo museu Nacional (Rio de Janeiro) No. 53. An acoustic analysis the Turkish whistling language of Lusköy. Revue Phonetique Appliqué, 14-15, 25-40. 1971 Of language knowledge, apes and brains. Journal of Psycholinguistic Research, 1, 1-29. Developments in biological linguistics. Georgetown University Monograph Series on Language and Linguistics, 24, 199-209.
Review: Language Disturbance and Intellectual Functioning, by C. K. Lubin. Linguistics, An International Review, 67, 113-117. 1973 The neurology of language. Daedalus, 102, 115-133.
Review: Elizabeth, by Sharon Ulrich. Merrill-Palmer Quarterly, 19, 147-149.
Review: Phrase and Paraphrase: Some Innovative Uses of Language, by Lila R. Gleitman and Henry Gleitman. Language, 49, 579-523. Eric H. Lenneberg. 1967. Biological Foundations Of Language. New York: Wiley. Lenneberg. New York: Plenum Press.